While some people may believe that the acidity and alkalinity of their food has a tremendous effect on health, the only part of the body that may be affected is your kidneys, according to a 2012 article published in the Journal of Environmental and Public Health. 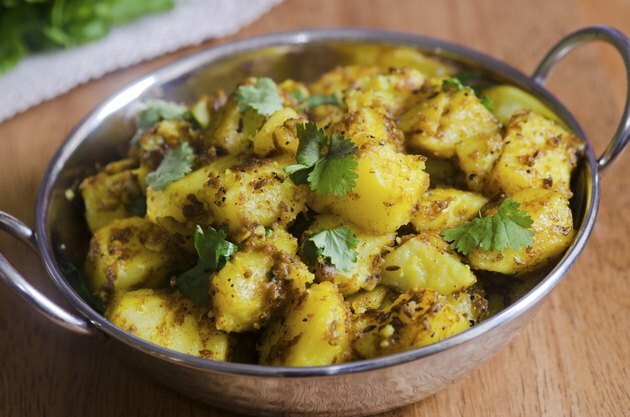 If you enjoy Indian foods and are trying to reduce the acidity of your urine to prevent kidney stones, you need to fill your diet with foods rich in potassium and magnesium to help balance your pH. Most fruits are a natural source of potassium, but if you're trying to increase the alkalinity of your urine, you may want to include fruits that are an especially good source of potassium. Fruits rich in potassium include melons such as casaba and cantaloupe, dates, papaya, mangoes, bananas, oranges, starfruit and persimmons. While most fruits are a rich source of potassium, if you're trying to increase alkalinity, you may need to avoid acid-producing fruits including plums and cranberries. Most vegetables are also rich in potassium and make a good choice when trying to include more alkaline-rich foods in your diet. Vegetables rich in potassium include artichokes, avocados, chard, cabbage, kohlrabi, rutabagas, potatoes, pumpkin, spinach, succotash, tomatoes, water chestnuts, bamboo shoots and beets. If you're trying to reduce acidity in your diet, you may need to limit your intake of lentils, which is considered an acid-producing vegetable. Certain high-fat plant foods may also help increase the alkalinity of your diet, including coconut and almonds. Almonds are a rich source of magnesium, which may be the nutrient that plays a role in increasing the alkalinity of your urine. Coconut meat and milk are a source of both magnesium and potassium but contain smaller amounts of these pH-balancing nutrients. There are a number of ways you can incorporate these foods into your diet to increase diet alkalinity. You can start each day with a healthy serving of fruit common in Indian cuisine such as half a papaya or a cup of cubed mango. Enjoy alkaline vegetables at lunch and dinner, such as curried potatoes or Indian-spiced Swiss chard. Also, you can add a little coconut milk to your tea or hot cereal and snack on almonds to improve alkalinity.